Our world is changing rapidly. The number of youngsters who lead us are increasing. The next generation is the time when we live in harmony with nature. For a long time, it was done by our ancestors. But, we tend to forget about this fact while we enjoy our modernized civilization. Ancient weaving such as Kudzu-fu involves the history and wisdom that human being have lived with nature for thousands of years. We would like to give you an opportunity to learn these things -making the thread and weaving the clothes from nature . Making clothes, one of the necessity of life (food, clothing and shelter) makes you feel moving your internal life. 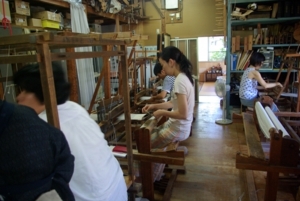 The purpose of this workshop is to hand the technique of making kudzu-fu, however, those who are interested in the environment conservation and sustainable clothes and also those who try to find the next generation are also welcomed. Kudzu-fu is one of the autumn seven flowers and familiar to Japanese. Kudzu-fu is made of fiber which is taken from Kudzu vine and woven by its fiber. It has a long history –Kudzu-fu in the New Stone Age has discovered and it was excavated around the Kofun-period(AD300-500). It was used as attire of nobles during the Nara and Heian period because of its shine. Samurai also liked Kudzu-fu and many kinds of clothes such as surcoat worn over armor is preserved till now. After Meiji era, Kudzu-fu was exported as wallpaper and used for the famous architecture in the western countries. The White House in the U.S. was one of them. However, the textile manufacturers are decreasing and there are some which makes Kudzu-fu. Ooigawa Kudzu-fu has the mission to let you know the meaning of happiness and to lead the world to the next amazing generation through our activities. Kudzu-fu Workshop will be held twice in this Aug. This workshop provides you an opportunity to the whole process to make kudzu-fu including Kudzu harvesting, weaving. You can see various techniques different from other clothes for making Kudzu-fu. In the lecture, we will talk about Kudzu as a plant. We refer to “the effective utilization of Kudzu” and “the environment and Kudzu”. 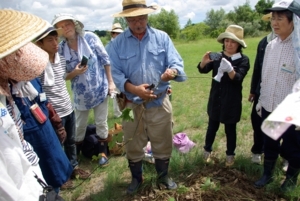 We also talk about the history of Kudzu-fu based on the recent research, and you can also touch the real Kudzu-fu made during the Edo period (1603-1867 A.D) and the valuable resources. We will welcome people from various backgrounds- including amateurs, professionals and researchers from all over the world . You will be able to enjoy harmonious atmosphere and get many friends. You can also have an opportunity to exchange ideas about various fields of textile. On the final day, you may feel stay together longer. Please feel free to join us alone. Please pay a deposit of ¥10000(Japanese Yen). We will let you know the bank account by email. You can pay the balance in cash or by credit card at our work shop. Accommodation, meals and dyeing materials are not included. The cost of the welcome party will be about 5500 yen. We will send you more details. In the e-mail, let us know which date ( Aug 2-6 or Aug 23-27) you would like to join. We will send you back an application form. Fill in the application form and send it back to us. Also, please pay the application fee at our online store. If you complete all the procedure, you’re ready to join! wear black in the field. We will have a welcome party at a Japanese restaurant which serves Kaiseki-ryori, a Japanese traditional course dinner. Wearing traditional garment ,like kimono ,or your own made garment will be welcomed. For further information click here !! We are looking forward to your comming!! Transfer at Shizuoka or Kakegawa stationto the local line (Tokaido line) and get off at Kanaya station (2nd stop from Kakegawa station and 8th stop from Shizuoka station). If you like you may also walk from Kanaya station , it takes about 20 minutes from Kanaya station, or change to Ooigawa railroad line and get off at Shinkanaya station. Five minutes walk from Shinkanaya station. 2 km south of Kanaya oojiro interchange of the bypass of National Route 1. 3km south of Kanaya interchange of Shintomei superhighway. there is the nearest business hotel to our studio. Copyright (C) 2007 Ohoigawakuzufu. All Rights Reserved.